Bradley Wright-Phillips celebrates his goal. @NewYorkRedBulls. 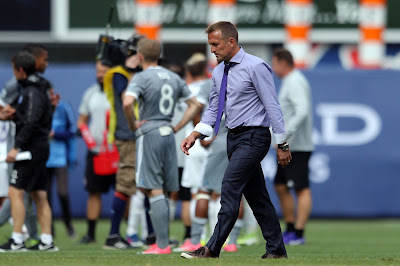 The Red Bulls had possibly their best performance of the season as they outlasted the Chicago Fire, 2-1, on Saturday night at Red Bull Arena. Bradley Wright-Phillips scored his fourth goal of the season, and team-record 73rd as a Red Bull, in the 37th minute off a cross from Daniel Royer. 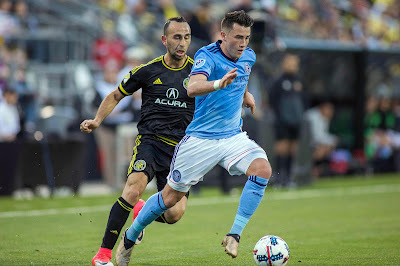 Jack Harrison in the special Earth Day jersey. Provided by NYCFC. New York City FC will wear specially designed adidas Parley Ocean Plastic jerseys at their home match on Sunday, April 23 at Yankee Stadium against Orlando City SC. This activation comes as adidas and MLS join forces with Parley for the Oceans to raise awareness around the harmful impact of marine plastic pollution. Four MLS teams will wear the new uniforms—which are made from technical yarns containing Parley Ocean Plastic —but they will be seen on-pitch for the first time Sunday afternoon.